Last weekend I attended the British Region convention in Meriden near Birmingham. 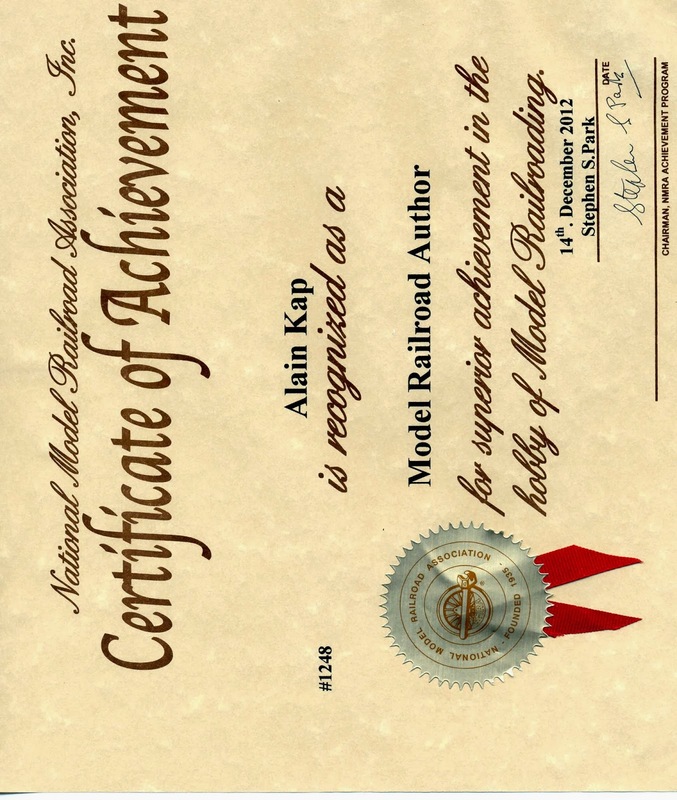 After the saturday night dinner I received the Author Certificate from the hands of British Region AP chair Steve Park. This is my 7th certificate toward MMR, but the right one has still to be earned, which is Master Builder - Cars to fulfill the requirements of having at least one certificate from the 4 categories. I also entered 6 models to be judged and the outcome of the contest judging exceeded my expectations so that from the 6 models I entered, 5 won a Merit Award with reasonably high scores. I'll post this in a separate post. The best and easiest way to start in the Achievement Programm in my eyes, is to begin with the Golden Spike Award. 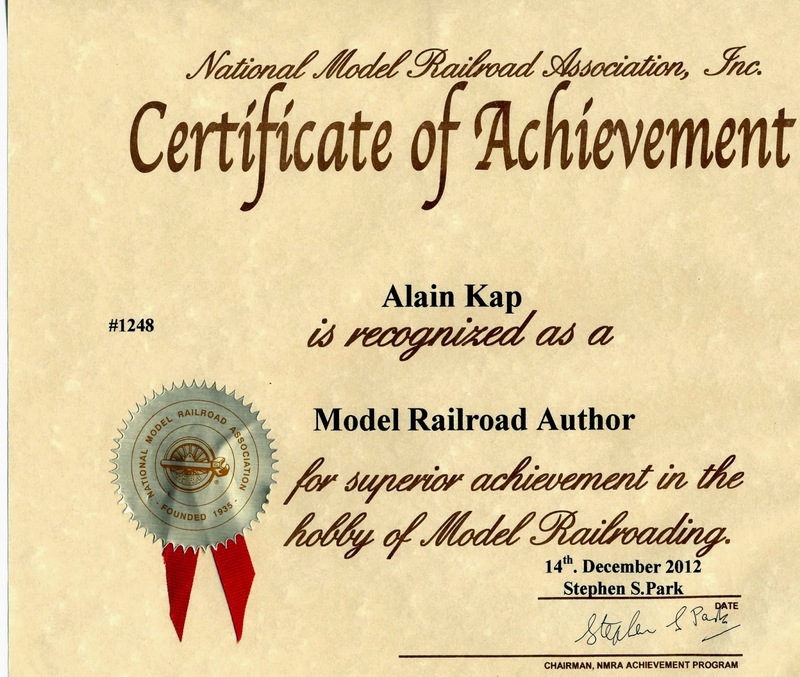 Many modellers own a home or show layout without knowing that they already have done a big part in achieving this award. Here is what’s to to. If not sure, ask your local AP chair. The Golden Spike is the easiest, and for many people, the first AP award that they earn. It is designed to demonstrate familiarity with different areas of the hobby, rather than expertise in a particular area. So take a look at the requirements - you may find that you have met most, or all of them already. Here's the Golden Spike Award Application Form . Use it as a checklist, you may surprise yourself. Display six (6) units of rolling stock (Scratchbuilt, craftsman, or detailed commercial kits). Notice that the requirement is to "display" them. Nowhere does it say that they must earn a minimum number of points in judging - just that they must be displayed. ( In the monthly contests at your division meetings, for example. Even having them set out on your layout, or a table in your basement counts as "display"). These models need to show a little more effort than a "shake the box" kit. For example, by itself a freight car kit straight out of the box, is not enough to qualify. However, by painting and decaling it, adding a little detailing, perhaps some weathering, etc., you'll have a qualifying model in no time! Construct a minimum of eight (8) square feet of layout. Again, there is no requirement about how good or how elaborate your layout must be - just that you must "construct" it. On the other hand, you may have trouble convincing someone that a loop of track nailed to a piece of green painted wood constitutes a "layout" . . . How much is 8 square feet of layout? Well, a typical module is 4 feet by 2 feet, and would easily satisfy this requirement. Construct five (5) structures (scratchbuilt, craftsman, or detailed and commercial kits). These structures may be separate, or one or more of them may be part of a single scene. The same comments apply here about the type of kits. The idea is to show that you can do more than glue a simple plastic kit together. Painting or weathering are good things to consider. Remember that "structures" aren't just buildings. Things like bridges and trestles also fall into this category. Three (3) types of trackage are required (turnout, crossing, etc.). All must be properly ballasted and installed on proper roadbed. Commercial trackage may be used. This requirement sounds a lot harder than it is. First, notice that last sentence about commercial trackage; you don't have to hand-lay anything - you can just install a store bought turnout. "Types of trackage" can be just about anything: turnouts, crossings, and grade elevation (a change in elevation of the track) are all examples of "types of trackage". Also, note that the three types DO NOT have to be different. For example, just having three simple turnouts will qualify. The "proper roadbed" requirement can be met by laying the track on a raised roadbed, ( such as cork ) and ballasting it. The purpose of this requirement is to show that you understand roadbed profile, drainage, etc. All installed trackage must be properly wired so that two trains can be operated simultaneously (Double-track main, single-track main with sidings, block or command control, etc.). This requirement can also be easier than it sounds. Notice the option for a single track main with sidings. This means that as long as you can cut power to the sidings individually, you can run one train, park it on a siding while you run another, then park it and run the first again. This meets the requirement. Provide one additional electrical feature such as powered turnouts, signaling, turnout indication, lighted buildings, etc. Don't read more into this than is there. A powered turnout can be something as simple as an Atlas turnout with a switch machine. Think in terms of anything that runs off the 'Accessories' terminals of a power pack and you 're half way there. One other thing to remember: Not all of these requirements need to be met on the same layout (or piece of layout). They don't even need to be met in the same scale! If you want to build G scale rolling stock, an N scale Model Railroad setting, and an HO scale layout for trackage and wiring, go ahead. Also, the Golden Spike, as well as the other parts of the AP have a certain amount of flexibility. For example, suppose you and your (friend / spouse / child) work together on all your projects, but do twice the required amount (12+ units of rolling stock, 16+ square feet of layout, 10+ structures, etc.). You can both be considered, as long as you can show that you have each demonstrated the required skills. Labels: Golden Spike Award, Where to start? A "Car" is just about anything that runs on rails and is NOT self-propelled (if it's self-propelled, it's Motive Power). This includes freight cars, passenger cars, maintenance of way cars (including equipment such as cranes), cabooses, cable cars, unpowered (dummy) locomotives, etc. Actually, if you have a model which is self propelled, but is a model of something that was designed to carry something (besides itself), such as a rail car, it can be used as one of the qualifying models for either Motive Power or Cars, BUT NOT BOTH. 1. There must be at least four different types of cars represented in the total of eight. One of these must be a passenger car. "Passenger cars" include anything that would normally be found in a regular scheduled passenger train including baggage cars, express reefers, business cars, or other passenger carrying cars like drover's cabooses. 2. Each of the eight models must be super detailed with either commercial parts or scratch built parts (for extra points). 3. In addition to being super detailed, at least four of the eight models must be scratch built. The term "scratch built" implies that the modeler has done all of the necessary layout and fabrication that produce the final dimensions, appearance, and operating qualities of the model. Basic shapes of wood, plastic, metal, etc. 2. You must earn a score of at least 87-1/2 points on four of the eight models in either an NMRA sponsored contest or in AP Merit Award judging. Note that only four of the eight must earn 87-1/2 points. The others don't even have to be judged! They do all have to be described on the Statement of Qualification (see below). 3. You must submit a Statement of Qualification. In order to acknowledge exceptional achievement in the many phases of scale model railroading, the following achievement categories have been established to encompass both the technical and service phases of the model railroad hobby. Earn a minimum of seven AP certificates (out of the eleven available) then submit a Statement of Qualification. Master Builder - Motive Power. Master Builder - Prototype Models. Model Railroad Engineer - Civil. Model Railroad Engineer - Electrical.